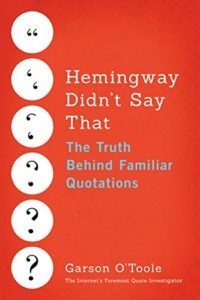 Your blog posts about Twain quotations reveal that the information on the internet about what he said or did not say is sometimes unreliable. I hope this motto is genuine. Can you figure out who said it? Quote Investigator: The earliest known attribution of a version of this quote to Twain occurred in 1907 [OMT]. However, QI believes that credit for this saying should go to the controversial novelist and essayist Grant Allen who published a variant in 1894. Indeed, Grant Allen was so enamored with the maxim that schooling interfered with education that he presented it in an essay and then restated it within at least three of his novels. The four works were published in: 1894, 1895, 1896, and 1899.